Thankfully the latest deadline day passed without too much upheaval at Aggborough with just two players having their short term deals either extended or put on a more permanent level. The first to be announced yesterday was the extension of Lee Bakers loan from West Brom until January. This should enable Mark Yates to kill two birds by continuing to fill the problematic left fullback role and also to see if he improves enough from his patchy performances so far into someone worth keeping when his parent club inevitably release him. Premiership quality he is not! not even Championship. Later in the evening came the news that many people were waiting for with the signing of Keith Lowe until the end of the season. Again, as with other players, it's a short term deal but that's the way the club seem to operate nowadays. Long gone are the days when a player that you have fought to get is given a long contract. The problem with this system is that if the player in question gets wind of another clubs interest then he will not sign a contract extension and we lose out again. Simon Russell was a good example. 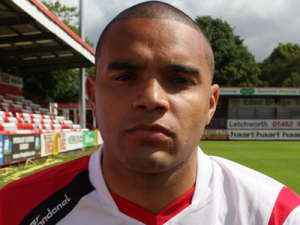 With the evening drawing to a close came the news that Iyseden Christie had left Stevenage for pastures new. He's gone to Kettering until January 17th with the option to make the move permanent. He'll probably take it because frankly leaving the Harriers to go to a supposedly better side at Stevenage was a massive mistake to make. Another one not offered a contract early enough. At midnight a huge breath of relief could be heard over the messageboard when a minute past struck. That signalled the news that the farce was over again until January 31st and also that Russ Penn had not gone to Walsall as our ill-intentioned board had wanted. Now he must be asked to sign a contract ASAP because come January this stupidity of trying to Dutch auction one of our best players will happen again. And again a Championship didn't come in with a million pound offer for Michael McGrath.